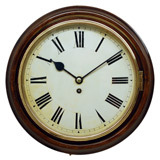 Given their correct name of 'English Dial Clocks' these popular clocks are our top sellers. We've fitted them in all sorts of houses in all sorts of places and they always look fabulous. Often referred to as Kitchen Clocks (as they are most frequently placed there), they are also known as School Clocks, Railway Clocks or Station Clocks. 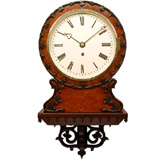 We own what is likely to be the largest selection of these clocks in the UK and have become very knowledgeable about them. 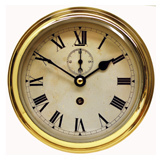 We offer a carefully selected stock of clocks in various sizes. All have mechanical movements, some of which are the fusee type. To learn more about these popular clocks and understand any terminology click here to read our Buying Guide to School Clocks (opens in a new window). The clocks on this page are ready to sell. 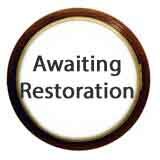 There is also a link to many more clocks that are awaiting restoration, which can be reserved and restored to order. 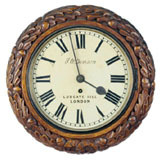 All the clocks are available for viewing and we can offer a Nationwide delivery service. 12" Dial (16" overall dia). 16" Dial (19.75" overall dia). 12" Dial (36cm overall dia). 14" Dial (43cm overall dia). 12" Dial (40cm overall dia). 6" Dial (21cm overall dia). 10" Dial (34cm overall dia). 10" Dial (36cm overall dia).